1. For the crêpes, sift the flour, hot chocolate mix and salt in to a bowl and stir inside the sugar. Make a well from the centre and tip within the beaten eggs, melted butter, milk and vanilla flavoring. Whisk to blend the ingredients and form an even batter, but never overwork the amalgamation. Leave to face or chill for a minimum of 30 mins. 2. For the chocolate sauce, break the chocolate into small pieces and in a heatproof bowl spanning a pan of simmering water. Add the butter and honey and enable to melt, stirring every so often. Remove from your heat and gradually whisk inside the milk until you have an easy sauce. If necessary, warm the sauce slightly before serving. 3. For the crème chantilly, in a very bowl, whip the cream together with the icing sugar and vanilla flavor to soft peaks. Cover and chill until willing to serve. 4. To cook the crêpes, place a non-stick crêpe pan more than a medium heat and give a knob of butter. When melted, tilt the pan so your butter coats the bottom. Add a small ladleful of batter and swirl to evenly coat the camp of the pan in a very thin layer. Cook for approximately 1½ mins prior to the batter is scheduled and golden brown underneath. Flip to cook lack of for a minute. Transfer into a warm plate and wrap in a very tea towel and keep warm. Repeat together with the rest from the batter, stacking the crêpes interleaved with greaseproof paper inside tea towel as is also cooked. 5. To serve, spread a layer of crème chantilly over one 50 % of each crêpe, scatter by toasted almonds. Fold the plain half with the crêpe within the filling to enclose, then fold again into quarters. 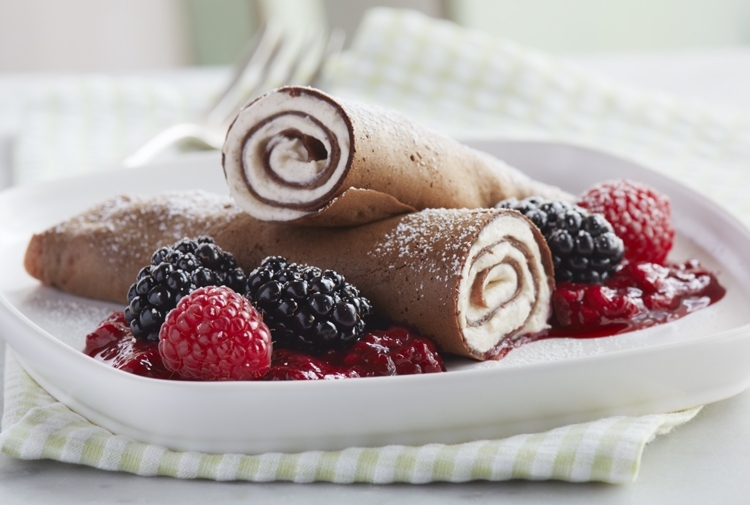 Place one filled crêpe on each serving plate and drizzle within the chocolate sauce. Scatter more than a few toasted almonds, and when you wish, top with many candied orange zest.